Every gardener has to have a few basic gardening hand tools. Whether you’re preparing soil in the spring, weeding, planting, turning the compost pile, or cleaning up in the fall, every gardening task has a set of garden tools to perform it. Choosing the right tool for the task takes a lot of the strain out of gardening. water wands or watering cans. Long handled gardening tools are designed for reach, and are great for moving piles of materials or performing garden tasks with minimal bending and stooping. They’re easier on the back than short-handled gardening hand tools, especially when you have a lot of material to move, or you’re working long hours at one garden task, like raking. There are some basic long-handled gardening tools every gardener should own: a round-nosed shovel, a flat shovel, a bow (steel) rake, a leaf rake, and a garden hoe. But there are also a few specialty tools, like an eye hoe, a long-handled cultivator, and a hula hoe, that make particular garden chores easier. A round-nosed shovel is the tool you’ll use almost every day you work in your garden, so it’s worth getting a good one. I like the Ames low-end contractor grade round-nose shovel. I’ve had mine for 12 years, and the handle is still sound, although the point is a little rounder than it was when I got it. I’ve moved dozens of tons of material with this shovel (19 tons one week a while back). It’s stood up to moving hills of gravel, sand, and wheelbarrow load after wheelbarrow load of heavy California clay. The best gardening hand tools are sturdy and well-made. With Ames pro tools, you get a well-made tool at a reasonable price, with the added satisfaction that it’s made in America. Ames tools are available in regional hardware stores like Orchard Supply Hardware in California. Corona also makes a sturdy round-nosed shovel. You can usually find one or the other at any store that caters to professional landscapers. 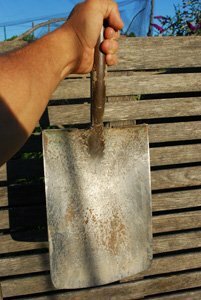 A flat shovel is the gardening hand tool of choice for cleaning up when you get to the bottom of a pile of gravel, compost, or mulch. Round-nosed shovels have a slight “V” bow to them, so when you get to the bottom of a pile they’ll leave a mound on each side when you push it through what’s left of the pile. A flat shovel picks all of this material up. A heavy steel bow rake is needed for raking, consolidating, and leveling heavy materials like soil, compost, or gravel. It’s the best gardening hand tool for leveling beds prior to planting. 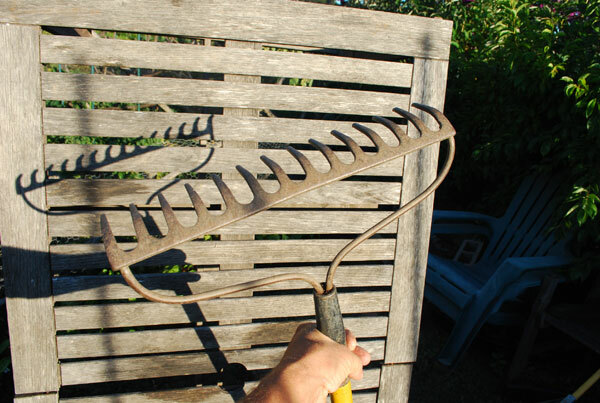 A bow rake is also useful for raking out lawn thatch that a leaf rake can’t handle. A leaf rake is needed for cleaning up and consolidating light materials, like leaves or grass clippings. The tines can be made of steel, bamboo, or plastic. Steel tines hold up better than bamboo or plastic, but bamboo and plastic are lighter, and the downward-curving front edge lets you grab more leaves with each stroke. 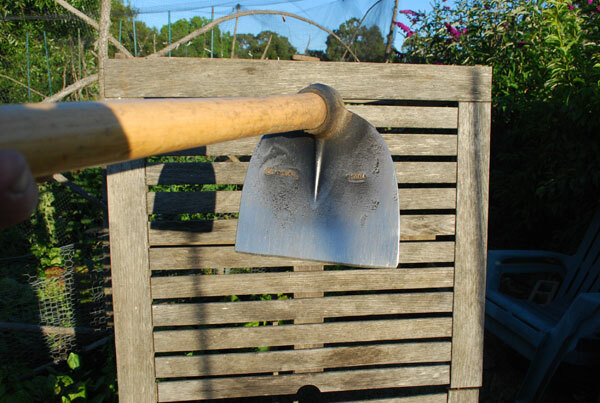 A garden hoe is traditionally used for severing the root crowns of weeds between rows, but I use mine primarily for pounding the clods out of soil and mixing compost and organic soil amendments into the soil. Organic fertilizers need to be in contact with soil microbes to be broken down and release their nutrients, so you have to loosen the soil, and mix them in. 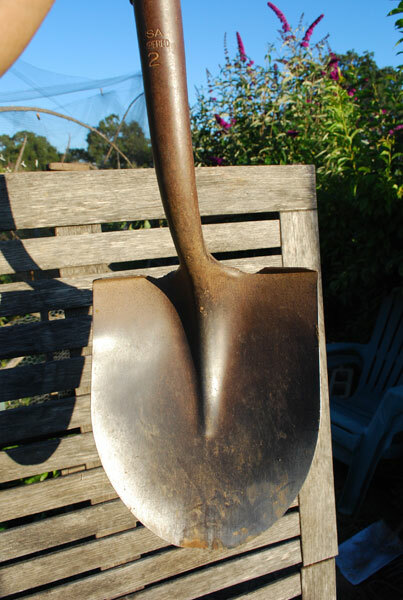 A hoe is the best gardening hand tool for incorporating organic soil amendments into the soil. 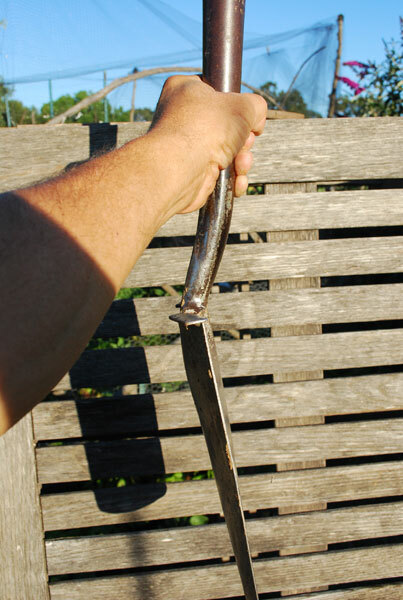 A long-handled cultivator is like a garden claw. It’s used for loosening compacted soil between plants without cutting as many roots as you would slicing into the soil with the blade of a hoe. A quick pass will also loosen the roots of weeds, making it much easier to pull them out. 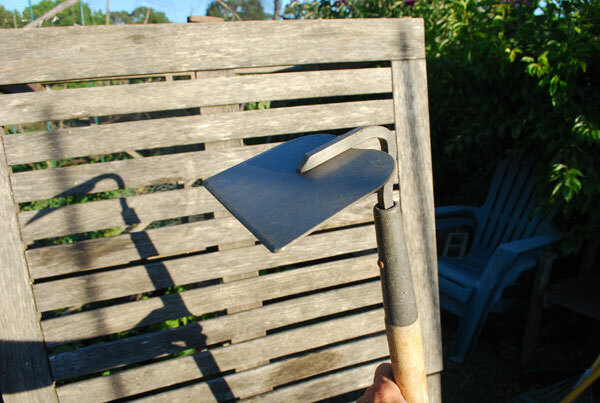 An “Eye Hoe” or “Grape Mattock” is a broad-bladed hoe that’s the best gardening hand tool for breaking up clods in heavy clay soils like we have in California. 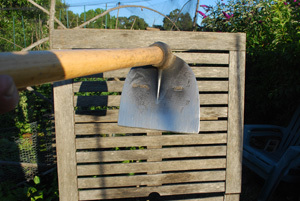 One blow from a grape mattock will shatter clods that would take 2 or 3 whacks with a standard garden hoe. The wide blade also cuts a wider swath through the bed, reducing the number of passes it takes to prepare a bed. A hula hoe, also called a duel-action hoe, is a squared hoop of steel at the end of a long handle. It’s used to chop down an inch or so into the soil, then sever the root crowns of weeds from their roots using a back-and-forth motion through the soil. Very handy if you have a lot of weeding to do, a hula hoe is the best gardening hand tool for weeding beds before preparing soil in the spring. Hula hoes work best when the top inch or two (5 cm) of soil is moist. If the soil surface is dry and hard, water the bed and do your weeding in softened soil the next day. Short handled gardening tools are designed for finer control and leverage, where needed, and for working in tight spaces where a long handle would get in the way. They usually have a D-shaped grip at the top. These are tools you get your back and your legs behind, for prying and opening soil. There are two short-handled gardening tools most gardeners own: a garden spade, and a digging fork (also called a spading fork). If you move a lot of materials in confined spaces, short-handled round-nosed and flat shovels can come in handy, but most gardeners would only use these tools occasionally. 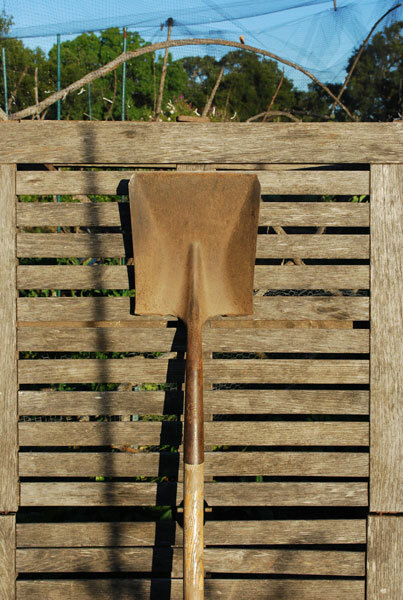 A garden spade has a heavy, slightly curved blade that’s narrower and stronger than a shovel. It’s the best gardening hand tool for carving the edge of a bed in native clay, because it cuts straight down into the soil. The slight angle and curve of the blade give it the rigidity and strength it needs to cut into heavy clay soils, even when they’re drying out. It’s also useful for shaving off the top 2” (5 cm) of turf or weeds when you clear a new area for a garden. 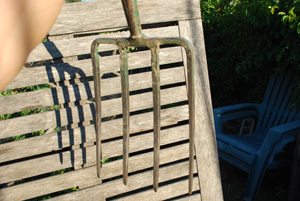 A digging fork, also called a spading fork, is a heavy pitch fork designed for opening and loosening heavy soil. It’s also the best gardening hand tool for turning compost, especially when you bounce forkfuls on the tines to break them up and aerate them as you’re turning the pile, like I do. 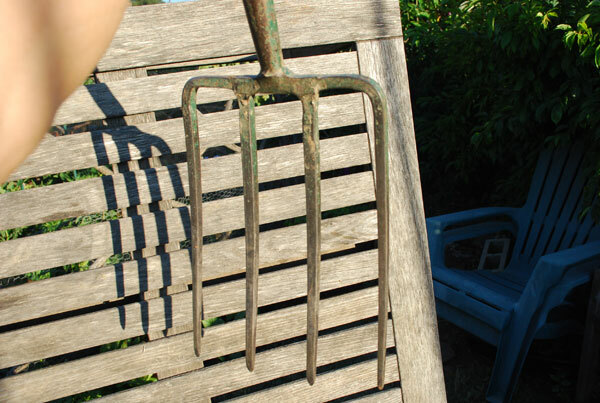 Look for digging forks with sturdy, square tines. Most spading forks you find in garden stores have thinner, rectangular tines that make them harder to use, and more prone to bending, than spading forks with thick square tines. 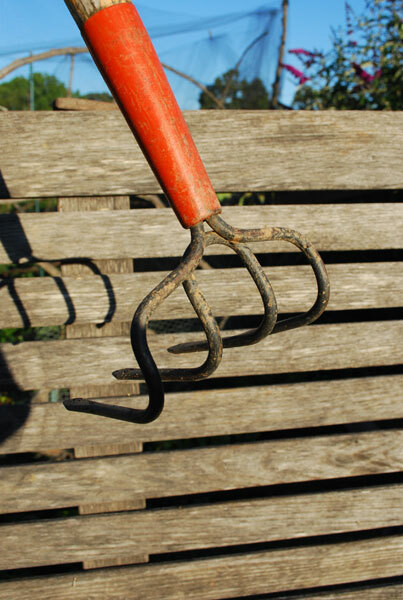 Even the best gardening hand tools can’t stand up to abuse and neglect. A digging fork is not a pry bar. If you use one to pry up a 2” (5 cm) tree root embedded in the soil, you’ll either bend the tines or break the handle. Water is the enemy of wooden handles. I learned this the hard way, when I left my $80 digging fork leaned against the wall of the shed through the rainy season. Water seeped down the handle, and the end of the tang where the handle enters the fork shaft stayed wet all winter. Fungi went to work, weakened the tang, and halfway through the spring digging, the tang broke off, and I had to ship the fork off for a new handle that was almost as expensive as buying a new fork. This will happen with any wood-handled gardening tool that’s allowed to stay wet for days or weeks on end. Store all wood-handled garden tools dry. If they get wet while you’re using them, lean them against a dry wall in a shed or garage with the blade up, and the top of the handle resting on the floor. This will allow water to drain away from the junction of the tang and blade, and keep it from rotting out. Water is also the enemy of metal. Always scrape mud off the blade after using a tool in wet soil. Blades rust if they’re allowed to stay wet, or if wet soil or mud is left on the blade when they’re stored. Spots of rust on a shovel blade make the blade “sticky”, so each thrust into the soil is more work than it is for a blade without rust. Keep your best gardening tools in good shape by using a steel brush with a scraper blade to clean them after use. When storing garden tools for the winter, make sure they’re clean and dry, and oil the blades and handles lightly with mineral oil or linseed oil before storing. Keep the blades and handles out of contact with concrete floors, which can hold dampness through the winter. Always store wheelbarrows in an upright position (leaned against a wall with the handles pointing up), so they don’t collect rainwater or condensation. Obviously, a wheelbarrow left open to the sky will collect rainwater. What’s less obvious, and much more damaging to a wheelbarrow, is the condensation that collects on the cold metal even when the weather is dry. Condensation will cause a wheelbarrow to rust out faster than standing water, because air circulating around the damp metal promotes rust faster than standing water.